Rosogolla is originally from Odhisa. In Odhisa, rogollas are more soft and less chewy than Kolkatar Rosogolla. 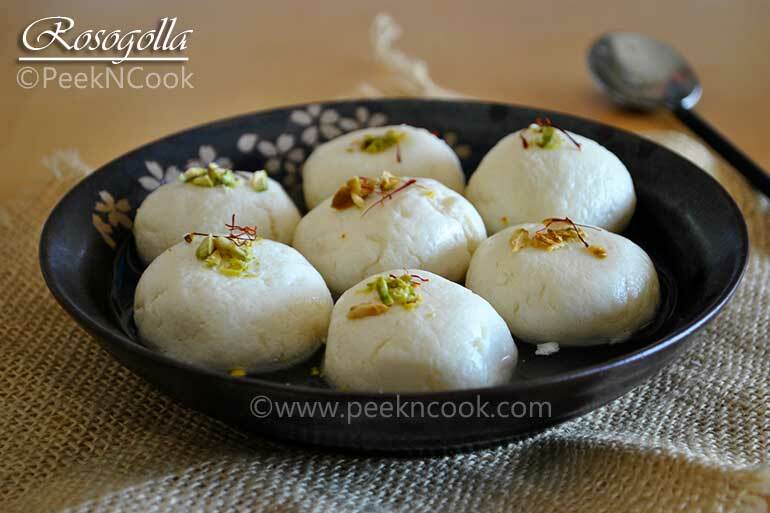 Today I'm going to share the "Kolkatar Rosogolla" recipe. Which is more easier than Rasgulla recipe. And "Bijaya Dashami", without "Rosogolla" is just impossible. After "Ma Durga Idol" bisarjan, rosogolla is must to greet each other. Bijaya Dashami just 2 days away. So I'm sharing the Rosogolla recipe, for Bijaya Dashami.....Here It is. "Rosogolla", this name does not need any introduction. Every Indian well known about this soft, melt in mouth sweet. This is our, I mean Bong's most popular sweet. Bong & Rosogolla just compatible to each other. No one can believe that Bong can not be a Rosogolla lover. Take a pan, add 1/3 cup of water at first and then add the milk (add the water first to protect the milk burning at the bottom) and bring the milk to boil. When the milk has started boiling add the vinegar+water little by little. Add all the vinegar+water and turn off the oven. But do not stir the milk after adding the vinegar+water. The milk has already started curdling. Now let all the milk curdle itself for 10 minutes. After 10 minutes take a cheese cloth and strain all the chhana. Run cold water to remove the sourness of the chhana. Now squeeze the cheese cloth to remove all the excess water of the chhana and hang the cheese cloth from the kitchen tap for at least 6 hours to remove all the excess water . After 6 hours open the cheese cloth and put the chhena on a flat clean surface. Now it's kneading time. Start kneading the chhana in a bowl or on a plate to make the chhana smooth. You have to knead the chhana at least for 10-15 minutes. The chhana will be smooth and will come together. Now make equal size balls. I made 8 equal size balls. If you want little large size rosogolla you can make 6 balls from the dough. Take a pan and add 2 cups of sugar and 5 cups of water and some green cardamom pods and bring the mixture to a boil. When the sugar syrup has started boiling add the chhana balls and cover the pan with an airtight lid and boil the rosogollas on medium heat for 10 minutes. After 10 minutes open the lid, turn the rosogollas and sprinkle some water and again cover the pan and boil for another 10 minutes on medium heat.After 10 minutes you can have them hot or refrigerate them and serve chilled. Garnish the "Rosogollas" with chopped pistachio & saffron strands. If you like ths recipe, please go to my Facebook Page & hit the like button to get regular updates.